We have regular ride outs – generally on the 3rd Sunday of each month from March to October. 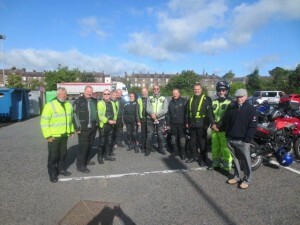 We also have a monthly mid week ride out on the 2nd Wednesday of the month. Plan your route – no more than 90 minutes to morning coffee stop. Another 90 minutes (max) to lunch stop. Keep it simple – not too many junctions. A complicated route spoils the flow. Pre ride your route with your tail ender. Remember a large group will be slower than the two of you. Suss out coffee and lunch stops, can they cater for 20 or so riders ? Let secretary have a note of the route – a basic route with stops noted. Consider preparing a handout for the riders with contact numbers and locations of stops/fuel. Record names of all riders on the ride. Ride leaders should demonstrate an advanced riding style, IE safe, legal, and progressive, with due consideration to road conditions on the day. Prepare a briefing with riders before you start, note junctions difficult to mark, fuel stops, identify leader and tail ender and make it clear that you will be obeying obey all rules of road, including speed and you expect everyone else to do so. Use the drop of system at all junctions, allows everyone to ride at their own pace, without bunching up.